Oh those lovely days when I can stay at home the entire day, without having to leave the house! I like a neat home, and to match my neat home, I need something neat to wear. For me staying at home the entire day does not mean slouching around in worn out sweatpants and a t-shirt that would do it´s best as a dish rag. That would be a bit depressing, and sad even, to be honest. For me too, comfort is the most important thing when it comes to my wardrobe.Only then comes beauty. Looking good means also feeling good. But one does not rule out the other. Here is my solution to home wear that meets both standards, beauty and comfortableness. A cotton jersey dress that is flexible to every direction. I live in the countryside, and I chose this fabric to match the surrounding nature. 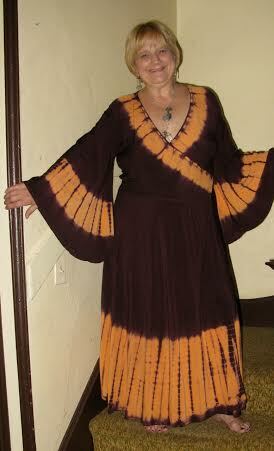 There are tree leaves in fall color all over the dress, just like it is in nature at this time of year. It makes me feel good to match my clothes to the environment. In fact I found this particular fabric already this past spring, and fell in love with it immediately, knowing I would need it in the upcoming fall. This dress creates the perfect feminine shape by fitting snugly at the waist and flairing a bit at the hem edge. The fuller the hem, the more narrow the waist appears. A feminine waistline is what makes us women different from men, and therefore is worth accentuating. Womanly power works wonders in this world… Let´s go for it! Deep down I am a tree-hugger, but it doesn´t show through this dress too aggressively. It is important to take a look at the side profile of a garment, as well as front and back view. Today´s fashion, with it´s loose tops, makes me look like a slumped, shapeless tent when seen from the side. It gives me the chills even to think about that sight in the fitting room mirror! A close-fitting at the waist makes this dress look good in this angle too. After all, a side profile makes up half of our being, so it should not be underestimated. Smile is the single most important accessory! In second comes a good posture. Those two are the only ones needed for this home look. I tied a simple earth green ribbon into a bow at the neckhole to make it appear less generous (in my case there is nothing to offer there either… =). So I don´t count the ribbon as an accessory, but rather a sewn-in detail in the dress. Now the work is done, and I´m all set for this fall. Ready to concentrate on life itself, not my clothes. That´s what I love about making complete outfits, they give me the freedom. The freedom of forgetting about my appearance for the day after dressing up in the morning, and simply live 100%! How cool is that? P.S. This is one of my favorite patterns, and I have made many different looks using it. Some examples are the Pier Dress, Little Black Dress, and Brown Beauty Dress. It is so great to find a good, fitting pattern, because it can be used to make any style I like!